Horizons in Insight can be picked across multiple volumes on separate surveys. When picking, horizons are located on the survey of the volume they are picked on. 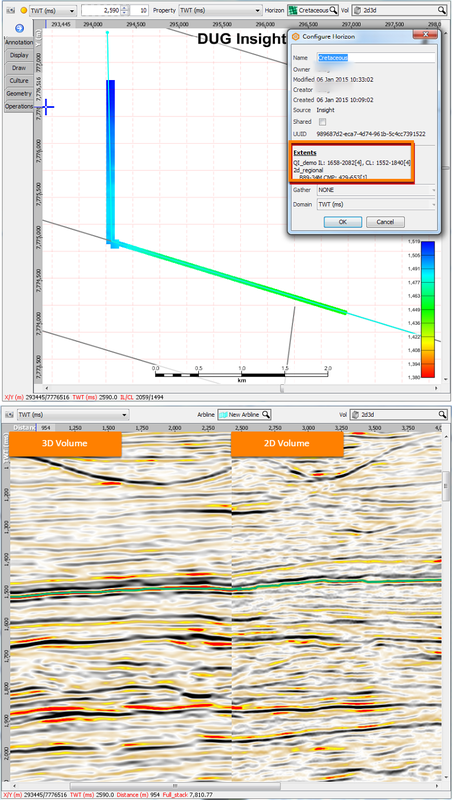 Because Insight allows horizon picking across multiple 3D or 2D volumes, this can result in a multi-survey horizon. When merging horizons from different surveys, the result will also be a multi-survey horizon. Each survey component is treated separately and, as such, you can pick at two depths in the same location. In this example, a seismic event is picked in a single horizon for the 2D and 3D survey components. Horizons can exist across multiple 2D and 3D surveys. The Extents section of the horizon configuration dialog shows that this is a multi-survey horizon. Picking a multi-survey horizon is similar to picking a single-survey horizon. Insight assigns picks to the survey of the displayed volume as they are placed. Picking in 2D Line View will assign the picks to the displayed 2D line and survey. Picking in IL/CL View will assign the picks to the current 3D survey. Picking in 3D View or Arbline View will assign the picks to the displayed volume. Some spatial operations will have unexpected results when using multi-survey horizons. The picks for each survey in a multi-survey horizon are treated separately, which is most evident when interpolating or extrapolating (see Horizon Interpolation/Extrapolation). Before performing these operations, convert multi-survey horizons into a simple horizon using the Regrid operation (see Horizon Regrid). Horizon Maths can be used to merge horizons (see Common Horizon Tasks). If the horizons are on different surveys, the resulting output will be a multi-survey horizon. This can result in multiple picks on areas that overlap. To resolve this, perform a Regrid operation to produce a single-survey (or X/Y) horizon. 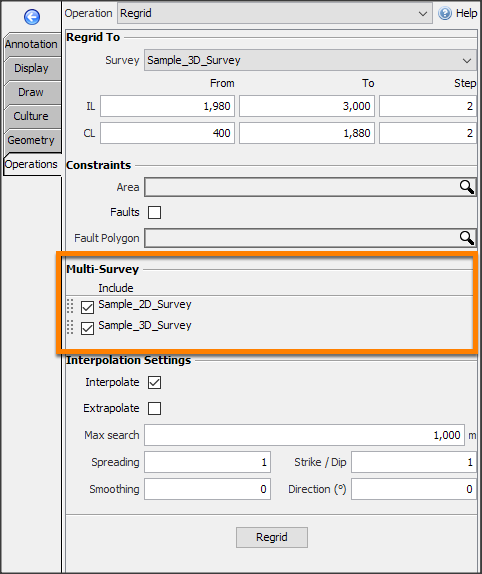 Multi-survey horizons can be exported in Insight's multi-survey format (.dugmsh) (see Exporting a Horizon). For more information regarding horizon export file formats, see Export Formats (Horizon).